Derek Sheils will compete in the Classic TT Superbike race for the Greenall Kawasaki team. Derek Sheils is set to make his racing return at the Classic TT. The Dublin rider has not been in action since the Skerries 100 at the beginning of July, when William Dunlop was killed in a crash during practice. In the wake of the tragedy, Sheils – who rides for the Burrows Engineering Racing team – decided to sit out the Irish National meetings at Walderstown, Faugheen and Armoy. He also skipped last weekend’s Ulster Grand Prix, but Sheils is set to compete in the RST Superbike race at the Classic TT for the Greenhall Kawasaki team. He will carry the number 14 plate, while team-mate Horst Saiger will have the honour of leading the field away from Glencrutchery Road at number 1. Dean Harrison will start as the red-hot favourite to repeat his victory in the feature race last year. Harrison lapped at over 127mph last August on the Silicone Engineering Kawasaki and returns to the Isle of Man in terrific form. The 29-year-old clinched his second TT victory in June when he won the second Supersport race. Harrison was also leading the Superbike TT until he was ruled out with a clutch issue and narrowly missed out on victory in the blue riband Senior, when he was overhauled on the final lap by Peter Hickman. The Bradford man, who sets off at number 2, clocked a lap of 127.212mph on the ZXR750 on his way to victory in the 2017 Classic Superbike race, although it was Bruce Anstey who established a new lap record of 127.496mph as he finished in second place. Sadly, the ‘Flying Kiwi’ is ruled out after missing the season through illness. Magherafelt man Paul Jordan will compete for the Mistral Kawasaki team as a late replacement for Derek McGee, who was injured in a crash during practice at the Ulster Grand Prix. Jordan, who impressed at Dundrod on Dafabet Devitt Racing Kawasaki – lapping at 131mph and finishing fourth in the Superbike race – joins Davey Todd on the ZXR750 machines as the duo make their debuts at the event. 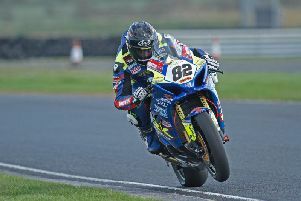 Todd was left battered and bruised after a crash in the Superbike race at the Ulster GP on the Burrows Racing Suzuki, but the 22-year-old hopes to race at the Classic meeting. Phil Crowe lines up for Team Classic Suzuki on an 1100cc XR69, similar to the machine ridden to victory by Michael Dunlop in 2015 and 2016. Michael Rutter sets off at number four on the same Team Winfield Yamaha that he took to second place in 2016, ten seconds ahead of James Hillier, who will again ride the Oxford Products/Louigi Moto Ducati. The Team York Suzuki pairing of Gary Johnson (7) and David Johnson (8) will also be targeting the rostrum, while Manx rider Conor Cummins is in a rich vein of form and cannot be ruled out as he lines up on the Padgett’s Motorcycles Yamaha. Jamie Coward (9) is another potential podium finisher on the Kraus Racing Kawasaki while Josh Brookes (11) is hoping for better fortunes this year on the Wiz Norton Racing after being forced to retire in 2017. Sam West (15) makes his Classic TT debut on a 750cc Suzuki and he will be followed by Danny Webb (16), who switches to a 500cc RG500 Team Classic Suzuki having ridden the 1100cc machine to sixth place last year. The RST Classic Superbike race will be held on Monday, August 27. Practice gets underway on Saturday.